Coalition organization Jumpstart works toward the day every child in America enters kindergarten prepared to succeed. The following post, Jumpstart Endorses Aim Higher Act, was published on Jumpstart’s website on July 25, 2018, and details the importance of this legislation to Jumpstart and other America Forward partner and Coalition organizations. Please contact Jumpstart’s Vice President of Policy & Government Relations, Mark Reilly at mark.reilly@jstart.org with any questions about the following post or to learn more about Jumpstart’s policy work. Please contact Jessica Crawford at Jessica_Crawford@newprofit.org to learn more about becoming a member of the America Forward Coalition. Jumpstart is proud to join dozens of leading higher education advocacy organizations in endorsing the Aim Higher Act, a comprehensive reauthorization of the Higher Education Act that puts students first. Jumpstart is excited to see the inclusion of a number of key provisions for which we have been advocating for in the legislation. The Aim Higher Act would meaningfully make college more affordable and valuable to millions of college students and aspiring college students. 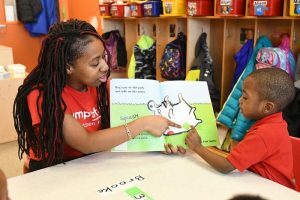 At Jumpstart, we know that the work of supporting and expanding affordable high-quality early education does not begin or end in the preschool classroom; we must create opportunities for college students to become early educators. Expanding opportunities such as the TEACH grant to include early educators (something Jumpstart has previously advocated for) puts a degree within the grasp of those in charge of teaching our youngest learners. As we have learned from engaging thousands of college students in service each year, many students struggle to afford college while also failing to gain all of the necessary training and experience they need to succeed in their careers. Early educators, who receive wages significantly below their elementary school teacher counterparts, face unsustainable futures and are unable to make ends meet between low salaries, high debt, and a lack of training. This important legislation provides students the pathway to attending, affording, and succeeding in college.